The song originally appeared on Mott The Hoople’s fifth studio album, 1972’s “All The Young Dudes.” The tune was also featured as the b-side to the title track when it was released as a single. Down N Outz – who play only Mott-releated tunes (including songs by Mott, Ian Hunter and British Lions) – were formed specifically to open a series of 2009 reunion shows for Mott The Hoople at London’s Hammersmith Odeon. The group features Elliott, The Quireboys' Paul Guerin (Guitar), Guy Griffin (Guitar) and Keith Weir (keyboards), plus Phil Martin (drums). 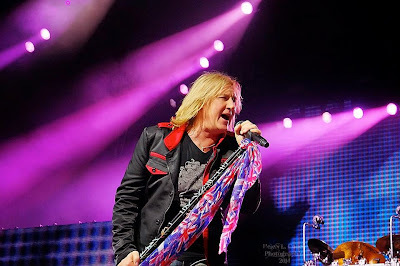 “The Further Adventures Of…” is the band’s third project, following 2010’s debut album, “My Re-Generation”, and the “Live At Hammersmith Apollo” DVD recorded during the 2009 shows. Elliott and Def Leppard are currently playing shows on a summer tour of North America with KISS.